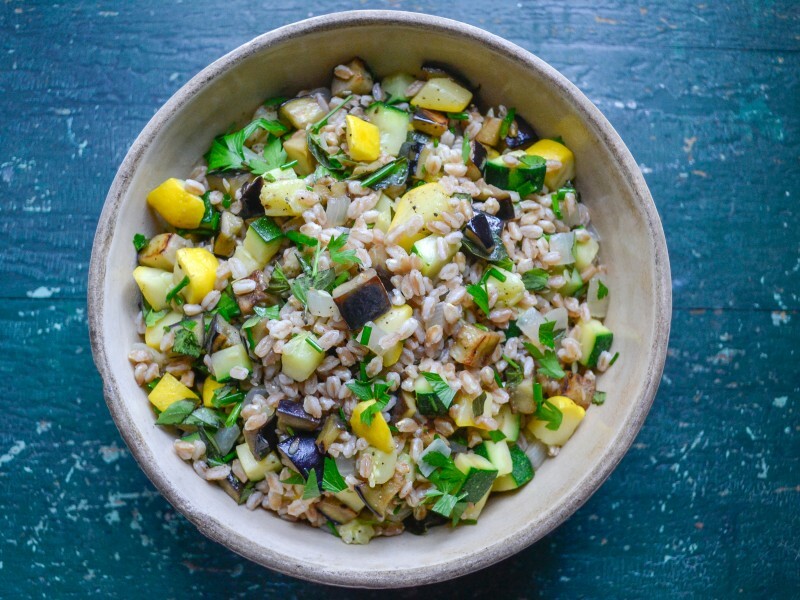 Take advantage of summer's abundance of delicious vegetables with this warm, hearty salad. Great as a vegetable main course or as an accompaniment to grilled steak or fish. For a heartier salad, sprinkle with 1/3 cup toasted sliced almonds or pine nuts before serving. 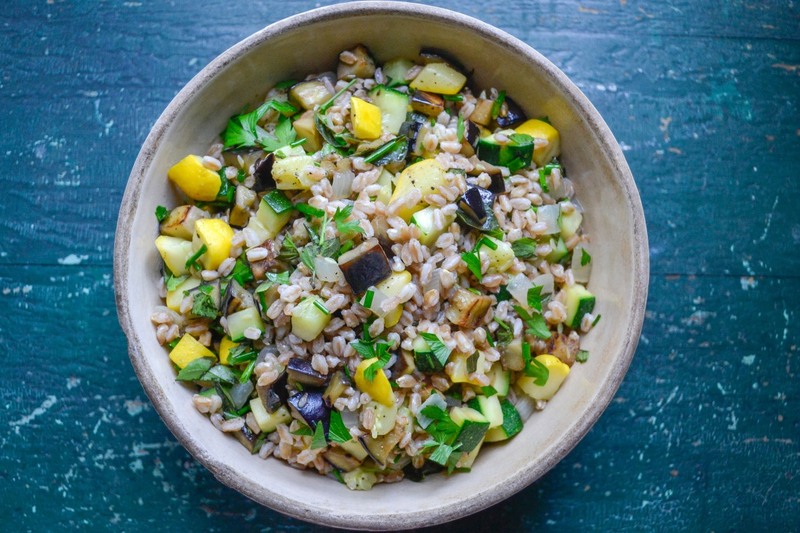 When the farro is tender, drain well. Add to the serving bowl along with the herbs and lemon juice. Toss to coat. Add a few teaspoons of olive oil, if desired. Season to taste. Serve warm, room temperature or chilled. Per Serving: 329 calories; 15g fat; 46.1g carbohydrates; 8g protein; 0mg cholesterol; 155mg sodium. 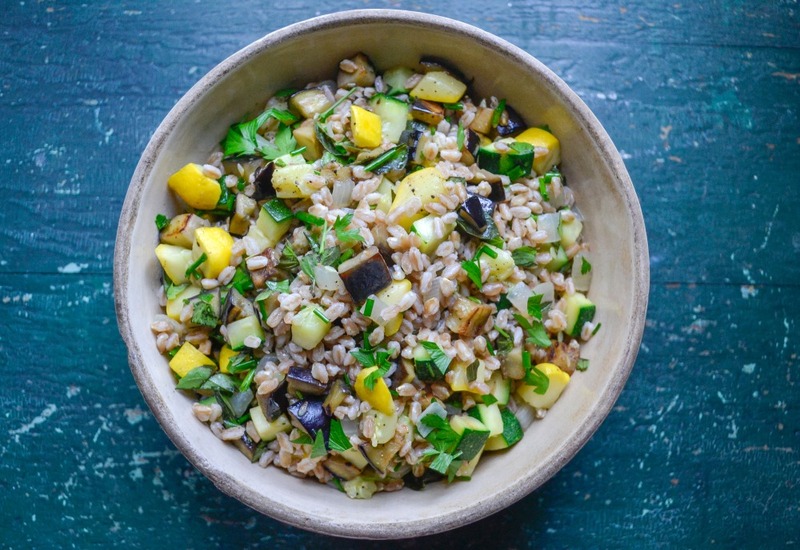 I was able to find farro at a new grocery store that opened up near our house, so I decided to try this recipe. The vegetables were really good, but next time I will probably try roasting them instead. We served it chilled, and it was perfect. Really nutritious, great tasting dish that took less than 30 minutes to make. I also added pine nuts for added crunch. It went perfect with grilled fish. I left out the eggplant and added diced tomatoes, it was really delicious and paired perfectly with grilled chicken. I'm going to try to make this dish in my pressure cooker next time. I added sliced almonds for some crunch, best decision ever! Paired this with a medium rare steak from the grill, it was nearly effortless! I served this as a side to a grilled steak and it was really good. We left out the eggplant and added extra squash. Really good overall.